The EOD Thigh Pouch is ideal for carrying demolition kit. Here's a great multi-use EOD Thigh Pouch that you can customize to fit your exact needs and at this price, don't limit yourself to just one. And at this price you can have one for each type of mission you're working on. - Front pocket with zipper closure. - Two side utility pouches for flashlight, multi-tool, pistol mag.....etc. - Additional mesh compartment on the back with zipper closure. - Single waist/shoulder strap for dual usage. 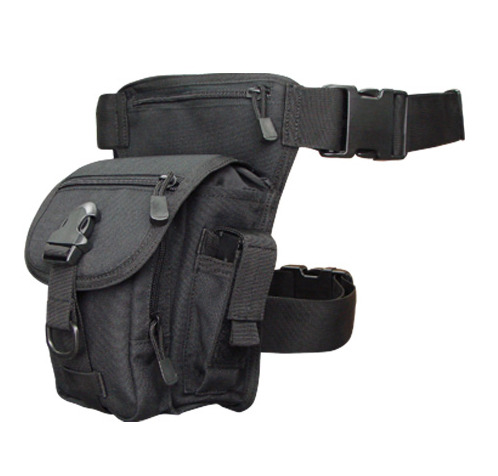 - Single detachable leg strap for stability when using as waist pack/leg rig. This kit is very versatile and comfortable to wear. The main compartment is big enough to hold something bigger than your fist and still has pockets for your smaller items. Was looking for a good thigh pouch to carry items I needed in easy reach. This product fit the bill perfectly! Able to wear on right or left, or remove the leg strap and allow pouch to slide and wear on front & back. Pouch sizes fit my needs and love the ruggedness & durability. Use this to hold stethoscope, torch, scissors, reading glasses, and some reference notes. I work as an Intensive Care Paramedic in Tasmania Australia and wanted a pouch that was easy to get on and off, one that i could spin around from side to back and one that did not cramp my stethoscope. A good stethoscope is quite expensive. This has worked really well. I don't use the thigh strap as i want it to be able to move around my body as said. It is also really comfortable.